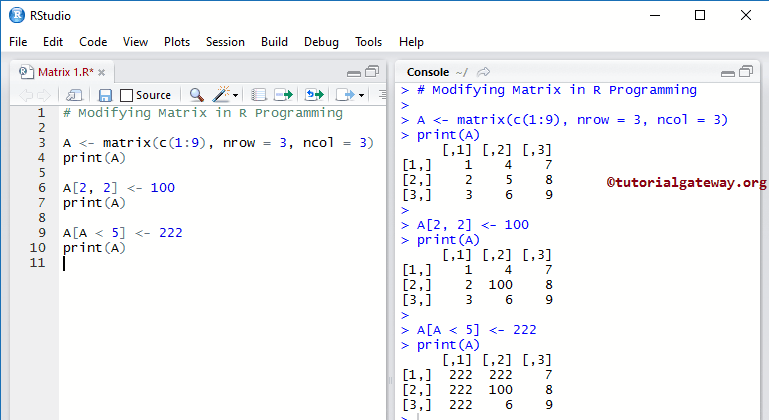 The Matrix in R is the most two-dimensional Data structure. 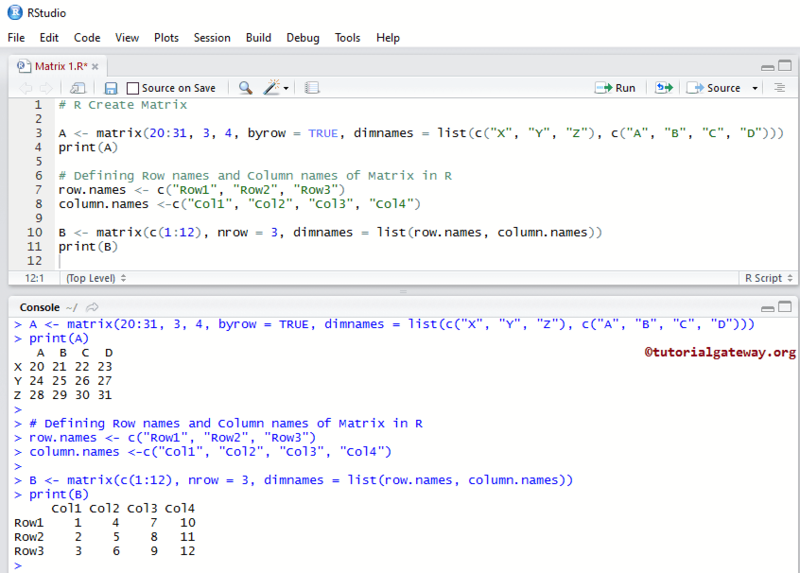 In R Matrix, data is stored in row and columns, and we can access the matrix element using both the row index and column index (like an Excel File). dimnames: It is used to change the default Row and Column names to more meaningful names. 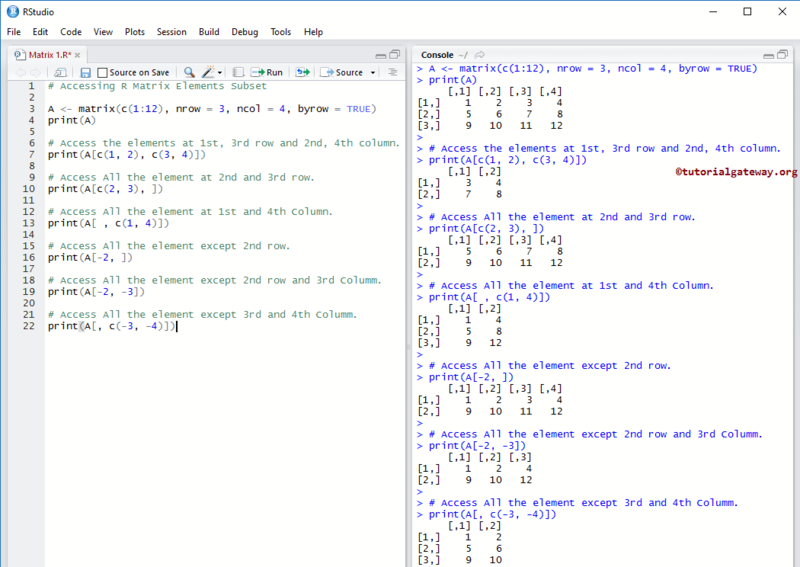 In this example, we will create a Matrix of 12 element. Following code snippet will show you the most traditional way to create a Matrix. 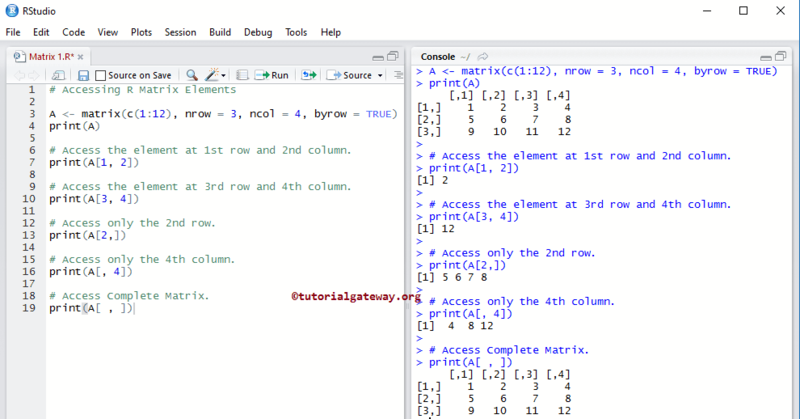 Below statement will create a Matrix of 12 elements arranged in three rows and four columns. All the above specify examples are working fine because we specify exact elements in Rows and columns such as 12 elements arranged in 3 rows and 4 columns. In this example we will show you, What will happen if we specify less number of element. 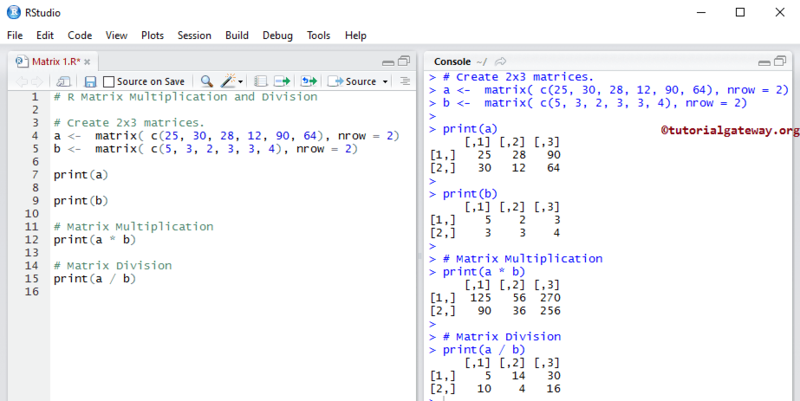 In R Programming, Class function will define its type and dim function will return the dimensions of the Matrix. 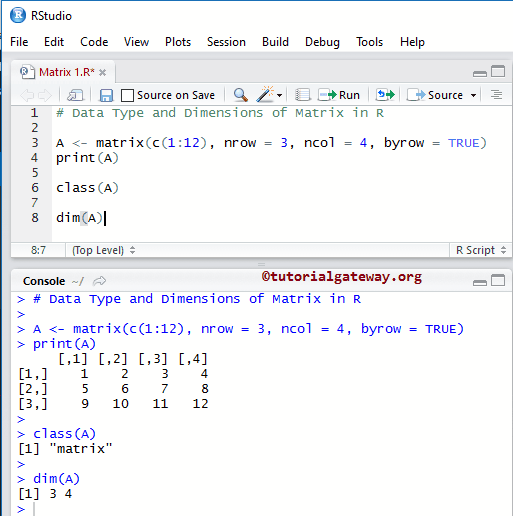 In R programming, We can use the index position to access the Matrix elements. Using this index value, we can access or alter/change each and every individual element present in the Matrix. Index value starts at 1 and end at n where n is the size of a row or column. # Access the element at 1st row and 2nd column. # Access the element at 3rd row and 4th column. # Access only the 2nd row. # Access only the 4th column. # Access the elements at 1st, 3rd row and 2nd, 4th column. # Access All the element at 2nd and 3rd row. # Access All the element at 1st and 4th Column. # Access All the element except 2nd row. # Access All the element except 2nd row and 3rd Columm. # Access All the element except 3rd and 4th Columm. In this example we declared a Boolean vector and used those Boolean values as the index position to access the Matrix A elements. Here, TRUE means access the value, and FALSE means omit. # Access All the element at 1ST AND 2nd row. # Access the elements at 1st, 2nd row and 2nd, 4th column. In this example we will show you, How to access the Matrix elements using Character Vectors Index values. From the below code snippet you can observe that, we assigned the Row names and Columns Names. This can help us to extract the Matrix elements using the Row names as the Index values. # Access the elements at 1st row and 3rd Column. # Access the elements at 2nd row and 2, 3, 4th Column. # Access the elements at 1st, 3rd row and 1, 2, 3rd Column. 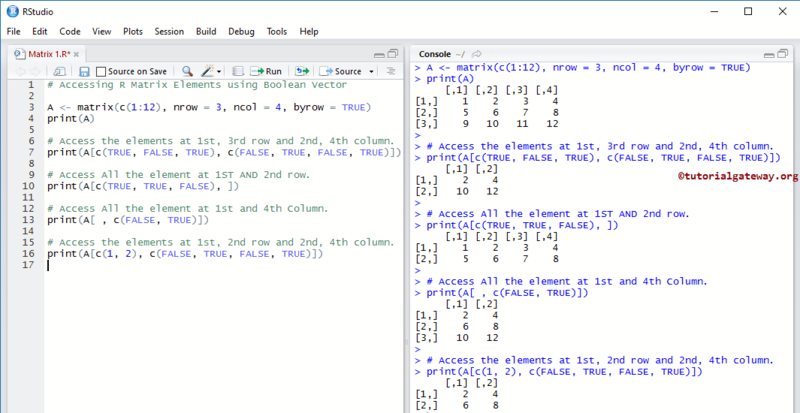 In R programming, We can use the index position to modify the elements in a Matrix. Using this index value, we can access or alter/change each and every individual element present in the vector. Below statement will assign 100 to the matrix element at position 2nd row and 2nd column. 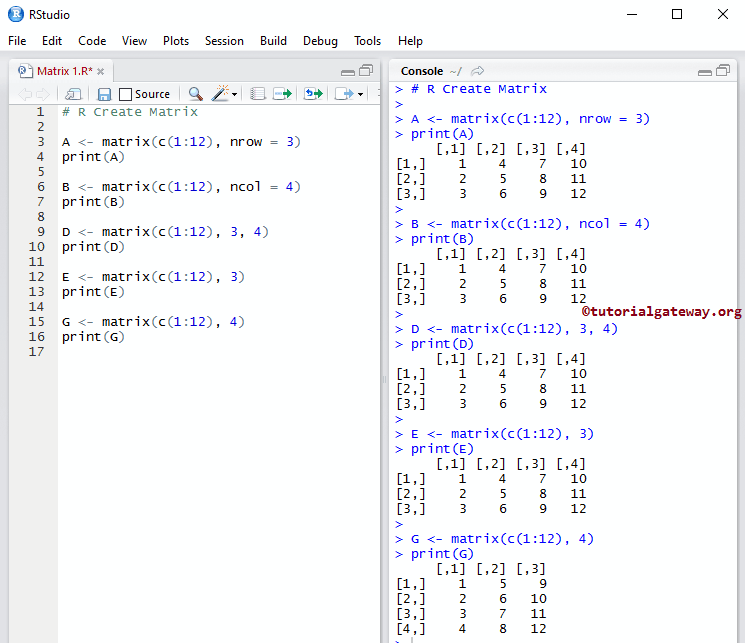 In this example we will show you, How to use R Arithmetic Operators on Matrices to perform arithmetic Operations on Matrix in R programming. 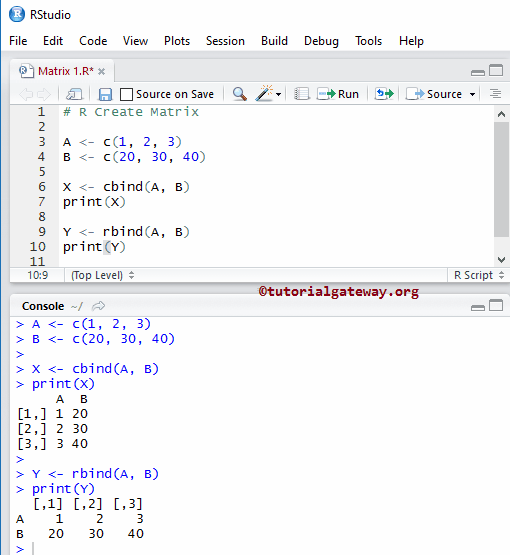 In this example we will show you, How to use R Arithmetic Operators on Matrices to perform R Matrix multiplication and Division.